I noticed a new option in my AdSense account: AdSense for feeds, a program that displays contextual and placement-targeted ads in FeedBurner feeds. FeedBurner announced in May that AdSense for Feeds will be available to a small number of publishers and now it seems that everyone can use it. FeedBurner has recently closed FAN, its advertising network. "No new applications for FAN publishers are being accepted and we expect the broad variety of options provided through AdSense (including the new AdSense for Feeds product, powered with FeedBurner feeds) will give publishers valuable new revenue-earning potential," says a FeedBurner/Google employee. 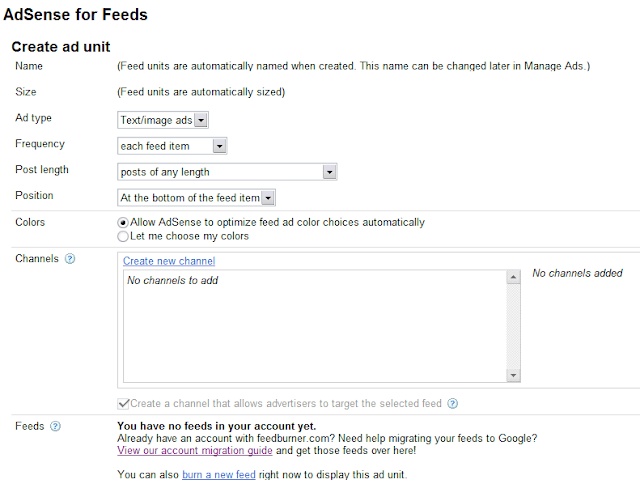 The new AdSense for Feeds option lets you create a new ad unit that has a format automatically selected from 468x60 and 300x250. "Generally, the 300x250 size will display when there's more content and when your feed is being viewed in a device with a larger display," explains Google. You can choose if you want image ads, the ad frequency, the position (top or bottom of the post), the colors and a channel that tracks the ad performance. For the moment, there's no connection between your AdSense account and the FeedBurner account, so Google automatically adds the FeedBurner service to your AdSense account. Unfortunately, your feeds are still connected to the old FeedBurner account and you need to migrate them first. The migration process is manual: just send an email at adsense-support-aff@google.com and mention your FeedBurner username and the AdSense account email address. 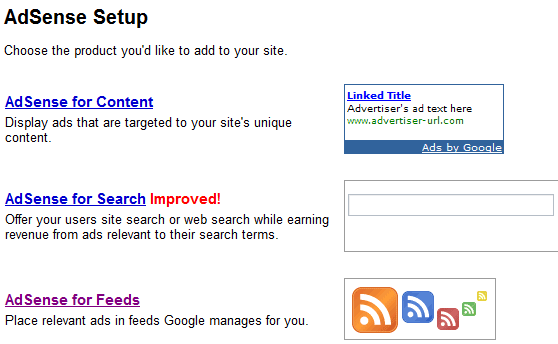 From AdSense, you can easily burn a new feed by entering the address of your blog and selecting some tracking options. The feeds can be managed at the new FeedBurner site, but there's no visible change other than the integration with Google Accounts and the new URLs for feeds: http://feedproxy.google.com/NAME. I doubt that these ads are an effective way to monetize feeds, since people use feed readers to get timely updates from a lot of sites and spend less time for each item. Besides, feed readers are mostly used by tech-savvy readers that are less likely to click on ads. At some point, I may experiment with some infrequent ads in Google Operating System's feed and I'll post my findings. The service is now publicly available, it's no longer limited to a small number of hand-picked publishers. I think that's so cool. I'm having a problem when activate this. Another reason this won't be as effective as Google's traditionally placed Adsense ads is the way in which feeds are accessed. Normally, when I'm browsing the web I'm looking for something. An answer, a product, a person. The (rare) times that I do click on Google's ads is when they're helping me find what I want. This type of activity is typical online behaviour. I'm searching for something, and Google's ads sometimes help me find it. So far so good. The problem is that this type of behaviour doesn't port over to a feed reader, and this is why it's not going to be a big win for Google. When I'm reading in my feed reader, I want to be entertained and I want to catch up with the people I follow. I don't have any burning questions and I'm not searching for anything in particular. So, I'm far less likely to click on an ad, particularly if it's stuck to the bottom of the feed. My behaviour and my motivation are completely different. What might work is embedded links into the body of the posts content. Now that'd be a service worth using. This is an old news, dude! Dude, just because you could use it doesn't mean it was available for everyone. The news is that AdSense for Feeds is publicly available and all AdSense publishers can include ads in their FeedBurner feeds. Good but nothing really new. Actually, it's very new ... at least new for 95% of the feedburner users out there who have been waiting patiently for it. My question is: will having adsense ads in my feed display ads when those evil spam blogs slurp up my feed and repost my entries? Because that would totally take the sting out! Very interesting point. The ads are actually some images included in your feed, so they'll be displayed in those spam blogs too. I find it a good step forward, I just wait for the results. Success! 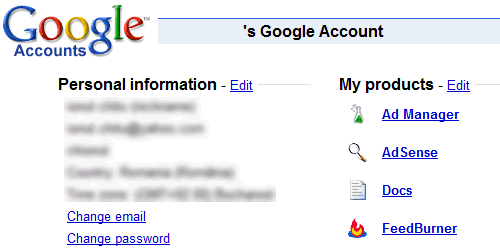 As you requested, we have migrated your FeedBurner account to your requested Google account. feeds.joepublisher.com) will stay the same, however you will need to make modifications to DNS for traffic to smoothly transition to your migrated feed(s). 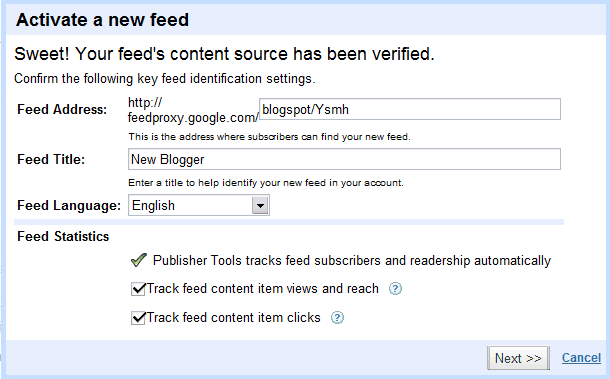 You will want to map feeds.YOURDOMAIN.COM to ghs.google.com. there is no reason to do so. Also, your old FeedBurner feeds, found at feeds.feedburner.com, will automatically redirect to their new addresses on the feedproxy.google.com domain. Just for completeness, you may still want to update any links or buttons on your website to use the new feedproxy.google.com address. I would suggest holding off migrating your Feedburner accounts just yet. As noted in the support thread below, migrating has caused all my Feedburner feeds to go offline with 404 or 502 errors. I have been down for about 8 hours at this point. Last week (or less), I burned a bunch of feeds (like over 100) through the new Google F/B system that are just generic search phrases used to effectively resyndicate feed material already existing on the Google public news system. I did this using what amounts to the generic feed encoding string that creates, as well as duplicates, any assumed news content that you could imagine. In other words, I'm not using an already-existing Blogger blog feed address or any other existing news feed source to create the feeds, but am just mirroring content already out there based on very general - and even random - search phrases that average users will input into a news' search engine (such as Google News or Yahoo News) on a daily basis, even thousands of times per day. In using the encoding string, I could place "apples+oranges" at the end of the string, and there I will have automatically resyndicated every news item that would be out there on the Google News system dealing with "apples oranges." ALSO, it does not matter whether I use my uniquely-created F/B address for "apples oranges" or if I just type in "apples oranges" directly into the Google News search, because the content results that come up in my browser are ALWAYS identical in both cases. I just barely created these feeds, and they are so new that the "bubble wrap" is still hanging off the edges. I have done nothing to effectively promote them other than to use the "Optimize" function in the F/B utility; and the only other thing I did was to use my Adsense account to SUPPOSEDLY insert ads into the feeds, which I know is not a "promotional" effort, per se. The feeds are generating a considerably large amount of page views practically overnight - AND - people are actually subscribing to many of the feeds on a daily basis already (usually only about 1 actual subscriber to the feed for every 10 or 20 viewers thereabouts). 1) People are subscribing to my generally unique "feed address", albeit with 100% duplicated information, even though the information was already out there floating around on Google forever before I came along, which I can't quite figure out. 2) The main reason I can't quite figure any of it out is because I CAN'T FIND my personal feeds ANYWHERE no matter how I've tried. 3) Whether I click into the feed directly through my unique feed URL, or to just do the same general search phrase in Google News (i.e., "apples oranges"), I also NEVER see any Adsense ads anywhere. 4) Pulling up the feeds by either method also NEVER produces the unique "FEED TITLE" that I chose for the feeds; and I can never find anything (outside of my F/B account) to distinguish that my unique feeds even exist in the world. 5) When I went through the motions of implementing ads for the feeds through the "Adsense For Feeds" utility, everything appeared to work perfectly, including to see the default message showing that, to the effect, "Your ads may not appear for about 10 minutes." As well, my Adsense account shows that ads are "RUNNING" on all of the more than 100 feeds I created. Can anyone please tell me what I'm doing right, wrong, or indifferently? Am I like in some sort of really far out nightmare that I can't seem to wake up from? Or is GOOGLE just making mush out of my brain? If I could just find out how these people out there are finding my feeds - AND - if I could even find ONE LITTLE AD somewhere, then I wouldn't feel like I've gone brain dead. I have been on the Internet for more than 15 years and have pretty well proven that there isn't anything I can't effectively research through any kind of search utility, but this one has me stumped. On the other hand, I am not nearly a "technical wizard" when it comes to any of these things. Also, if you can tell me what I might be doing wrong that can turn this thing around into about 500 bucks a day in revenue, then that would truly make me feel wonderful. By the way, good luck in the next upcoming Great Depression, which I predicted 16 years ago would happen in less than 20 years from that time. I believe the hammer is coming down. Sounds like a good idea but do users really click on ads in the feeds. I have a doubt about that. I also feel that very few pay attention to ads in the feeds. I do not know what is the success rate? It is good but i could not able unedrstand properly. . . Anyone tried it, what is the conversion rate? Can some know its conversion rate? ?